Venus transits in front of the sun in 2004 -- in one of the rarest events in the Solar System: an alignment of Earth, Venus and the Sun. Australia is gearing up for the transit of Venus, an event with historical significance as a previous occurrence in 1769 played a key part in the "discovery" of the southern continent. Australia was gearing up Tuesday for the transit of Venus, an event with historical significance as a previous occurrence in 1769 played a key part in the "discovery" of the southern continent. When Venus on Wednesday passes between the Earth and the Sun, an astronomical event that will not occur again until 2117, millions of people will be gazing to the skies, just as Englishman Captain James Cook did in the 18th century. Cook was not just a keen sailor but also an avid watcher of the planets and in 1768 he set sail for Tahiti on HMS Endeavour to record the phenomena that occurred in 1769. It was one of only six transits ever observed since the invention of the telescope -- in 1639, 1761, 1769, 1874, 1882 and 2004. After a successful observation he was sent to seek the "great south land" thought to exist in the Pacific Ocean during which he discovered and charted the east coast of Australia, staking a British claim in 1770. Australia was first settled as a British colony in 1788. "Culturally, for modern Australia it's a very significant event," Sydney Observatory senior education officer Geoffrey Wyatt said of the transit. "It is technically just a little black spot on the sun, but historically it's so important for us." Weather permitting, Australia will be one of the best places to observe the spectacle as the entire transit is set to be visible from eastern and central parts of the country. 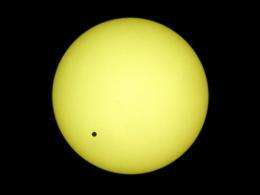 A series of events are due to be held, with viewings through telescopes adapted to protect the eye, but forecasters have put a dampener on expectations of seeing Venus cross in front of the sun. A major storm front was closing in on Sydney Tuesday, bringing gale force winds and torrential rain, which are set to extend into Wednesday. The transit is due to begin Tuesday evening in North and Central America.